This has got to rank among the best high cloud sunvex Parrys ever. Probably this is the best one. Maybe even beats the dust ones. Also the photographic documentation is positively extensive. Czech halo folks got the moves. This is the best sunvex Parry arc I´ve ever seen. Wow. Its just incredible. 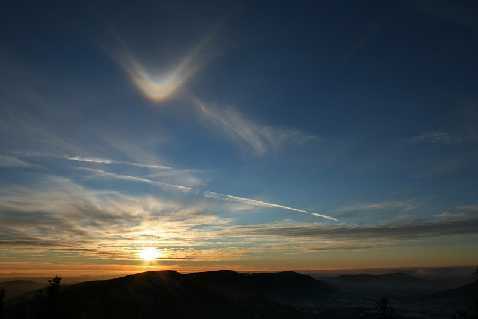 And its nature´s own; purely natural phenomenon. Not something out of artificial lamp beams used under dark night conditions or dug with massive digital processing from background light. Indeed, this ranks among the top photos! Nature creates wonders. Surely, the beauty of a display seen with naked eyes in sun- or moonlight is extremely precious. I'm cherishing such moments in my memories; they are among the dearest ones. The lamp and photo-processing is a blessing, however, which should not be degraded at all. They are useful tools that lead us closer to the understanding of halos and ice-crystals. Unless one has not been bathing in the light, one may not be able to appreciate it. During the 7th November halogen lamp display in Rovaniemi I called Ruoskanen and Luomanen and told them it was among top 5 halo experiences of my life. Thinking now of what the other four could be, I would say it was actually in top 3. "Massive digital processing" is needed to extract faint features from digital photos or pieces of film in order to see what purely natural phenomena nature creates for us to marvel. Sometimes the esthetical sensation is missing when faint halo arcs or patches of light are dug from background noise. Those digital processing methods, however unesthetical photos they may produce, increase our understanding of halos. Using artificial light sources simply increase our possibilities to experience fantastic haloshows. Without such possibility this winter here in Southern Finland would have produced zero interesting haloevents. Like Riikonen said, those spotlight halos at their best are truly amazing moments for an individual - just like seeing this incredible Parry arc must have been for Emil Brezina. 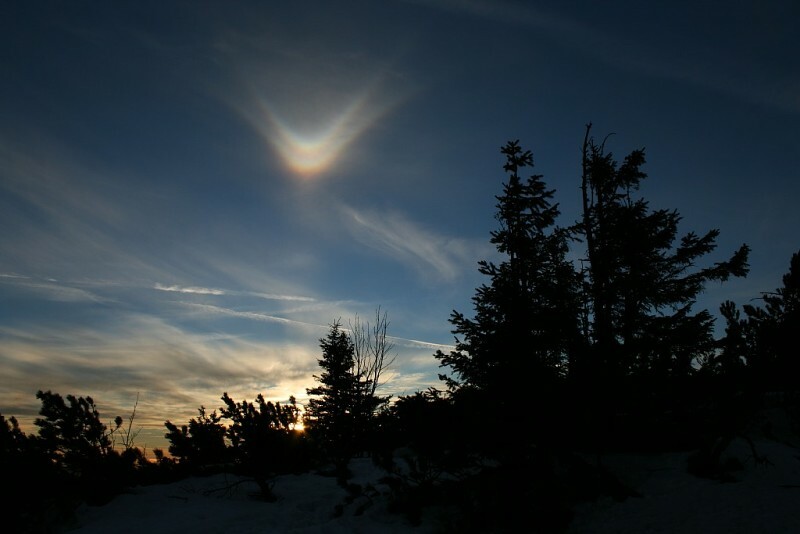 To me all good quality halo events are equally important and noteworthy, regardless whether it is a high cloud sun halo or a display where the halos are formed in spotlight beam and formed by ice crystals caused because of nearby snowgun operation. I feel I must supplement my comment with some sentences. The spotlight is not merely a useful tool for studying halos. Experiencing what it feels like standing there in the beam and watching the billions of crystals flying around and building up the halos is simply uplifting. A moment that will never be forgotten by the person who experiences it. I strongly agree with Jukka and Marko Riikonen. This high cloud sunvex Parry is spectacular – a truly magnificent observation and photograph. 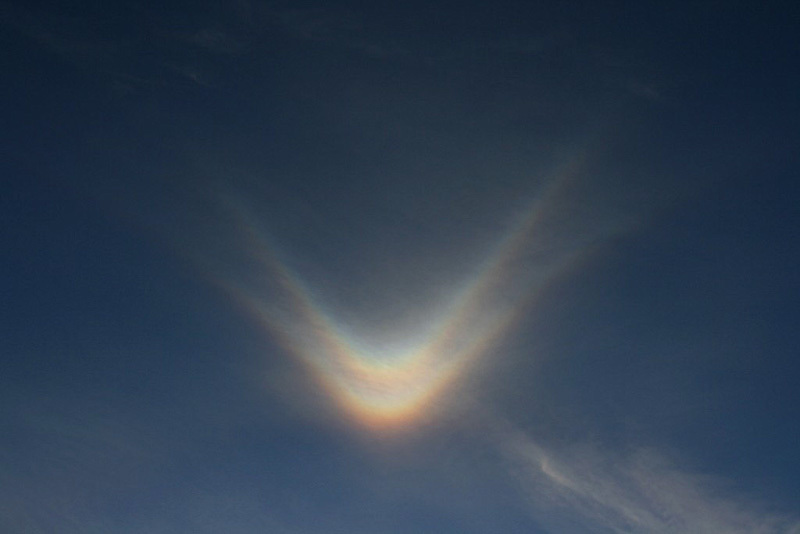 Amidst all the diamond dust displays it is good to remember how rare this kind of a well developed Parry arc is in high clouds (or in any situation for that matter). I’m glad that we’re having this interesting discussion about halo photographs here. In my opinion, it is difficult to differentiate observations based on the light source. The halos are not right or wrong, genuine or fake. They just are. Whenever and wherever crystals are present, light from whatever source will follow the ray paths available to it, thus producing the halos that are possible in that setting. To the observer the halo may seem dim or bright (depending on the relative intensities), common or rare (depending on the observer’s experience and knowledge), beautiful or ordinary (depending on his or her individual tastes). Or some other set of attributes. It goes without saying that our cognition is shaped by many things. Halos in a searchlight beam will have great relative intensity due to the darkness of the background sky. High up on the mountains, a similar edge (obviously not of similar magnitude though) can be gained as the sky will be darker blue. I believe this contributed for example to the Lascar display. A photograph (or a stack of photos) is a good record of what has been present. Dim halo forms in heavily post processed images can be valuable. Their beauty lies in the information they offer. Clearly, we must be aware of post processing artefacts, but that’s the case with any photographic evidence. It’s about pushing the envelope, reaching for new territories. Take, for instance, various types of astronomical imaging. Post processing the image data is an integral part of the activity. Similarly, these new halo photography techniques (albeit on a drastically smaller economical scale) are now unlocking the doors to a whole new zoo of halo forms. I embrace this development just as I embrace the progress in many other areas of exploration. It does not strike us as odd to see detailed images of distant planets. Of course, a telescope and some relatively sophisticated imaging skills are required. We routinely admire crystal photos taken through a microscope - if one wants to understand the crystals better, why not use a microscope? If one wants to understand halos better, why not use a lamp? Why not post process? I would think that in the future post processing will be seen as a "natural" part of most brances of photography. Obviously, when dealing with natural phenomena and trying to scientifically comprehend them, post processing must be used to clarify the phenomena, not to fake it. In this sense RAW files are very valuable. They preserve the pixel level information recorded by the camera and can always be used as reference if the situation calls for it. Furthermore, when shooting RAW one takes the responsibility of adjusting the white balance, contrast etc. instead of just leaving it to the camera. As to the visual pleasure and the art in halo photography, it is up to each individual’s subjective taste, experience and reasoning. I can personally echo Riikonen’s thoughts on this. Once you’ve been in the beam, there’s no turning back. I will never forget the first time I saw the diffuse arcs in the beam of a powerful searchlight. As I walked away from the light source, the diffuse arcs kept me company, moving before me in dazzling beauty. No words will do justice to that sight. And there are other effects as well, some of them difficult to capture in a still photograph. Hopefully, good quality yet reasonably priced HD video (that we can post process) will soon be available to us and come to the rescue. I suggest we divide into two groups. One group continues stacking, unsharp masking, searchlighting and halo making with kaolin water. The other group makes only visual observations in strictly natural circumstances and records them with primitive tools in a cave wall. I cannot help being slightly amused. The following 3 lines were answered with roughly 100 lines of text, that is sofar. "And its nature´s own; purely natural phenomenon. Not something out of artificial lamp beams used under dark night conditions or dug with massive digital processing from background light." There is an incredible amount of sheer interpretations of what might have be between the lines I wrote. Words like "degrading" and "cawe wall" have been used. There was nothing between the lines, unlike in the interpretations made here. Let me illustrate the situation. Marko R> What a fantastic halo! Jukka R> Mindblowing sunvex Parry arc! Marko P> Wow, beautiful. And its upper cloud stuff! Can you imagine! No digital processing required, not a lamp one. Just incredible. Jarmo M> Yes, what a display! Marko P> Marvellous uppervex parry. I wonder have you even gotten any of that strength by using caoline under dark night conditions and processing the hell out of it? It would be interesting to compare. Shall we go and try? Marko R> We haven t got that strong uppervex Parry's yet, not even in Kilpisjarvi. But we must try. Perhaps we could use still stronger lamps? Marko P> Nice idea. Anyhow the Czech halo folks got the moves here, just like you said Marko. Marko R> Sure, its incredible that its in upper clouds and still the best developed ever. Jarmo M> How about now going outside to the beam of light with billions of crystals? Jarmo M> Oh that's a bargain. Marko P> I am really exited of this lamp thing. Its the most incredible new tool for halo science. And guess what? Marko P> I just cant wait to see more of these beam displays. What I particularly appreciate in them is the certain magic in the air and the closeness of crystals. It reminds me of that one parking lot experience of 3 dimensional Minnaert cigar type we saw in Fairbanks Alaska 1996 winter camp. These are just out of this world. Marko R> Lets just get out of this door. Jarmo M> I am already here. Nice play script, Marko P. Maybe one day we can perform it in a halo meeting. All: "Wow, and its upper clouds!"